Fancy title, innit? For the record, this is my shop and I’m doing the upgrade to my own bandsaw, but I did not come up with this idea; I’m just documenting it for posterity. 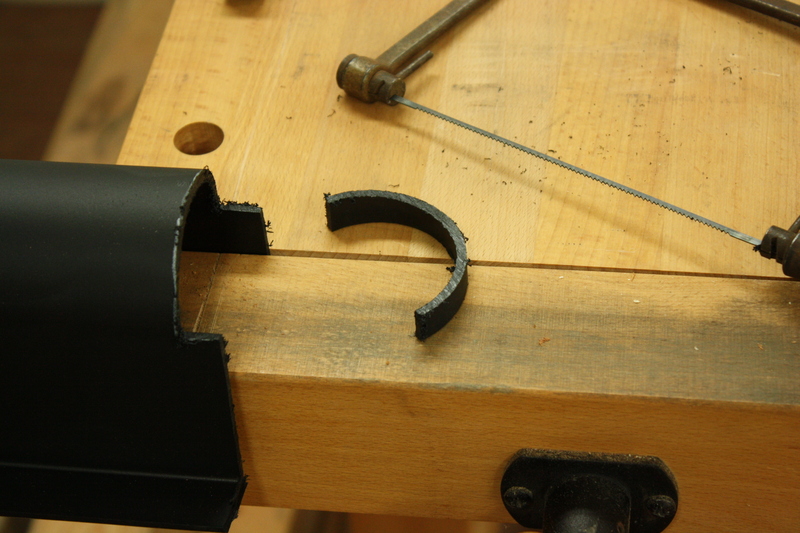 A few months ago, a friend of mine, Dan, helped me tune up my bandsaw. The next time he saw me, he gave me a large box and told me how to use what was inside for better dust collection. 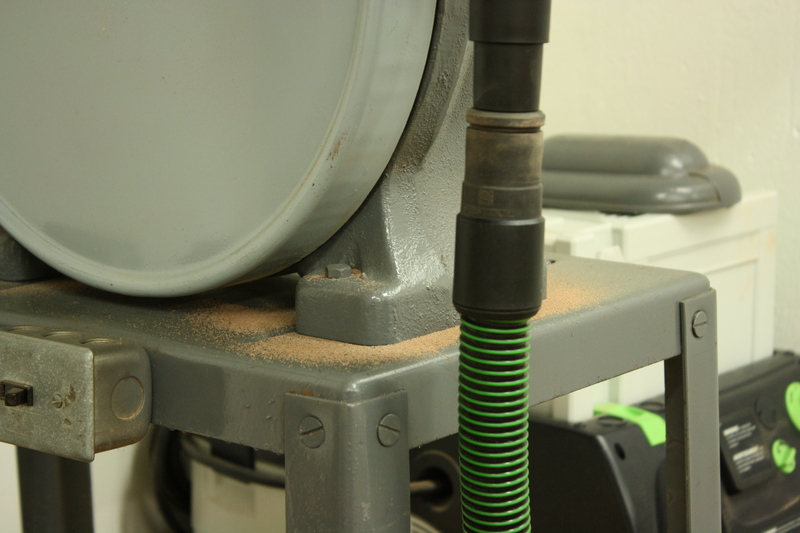 I put it off for a while, but after moving the bandsaw down into the shop and using it a few times, I could see why the dust collection was necessary – when you don’t run a table saw, planer, or jointer in your shop, you can easily tell when something is spewing dust into the air. 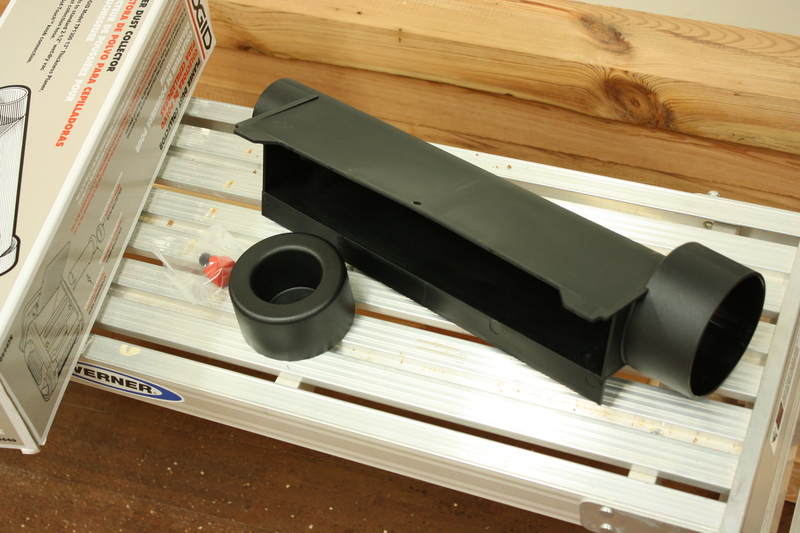 So this past weekend I set about rigging up some dust collection for my bandsaw. 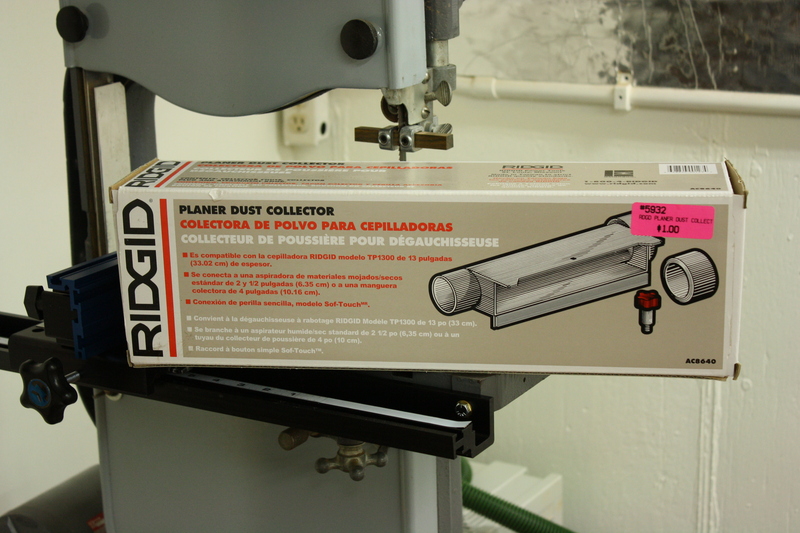 The item Dan gave me was a Ridgid planer dust collector he’d picked up on clearance for $1.00. He showed me a picture of how he’d set his up and I went from there. 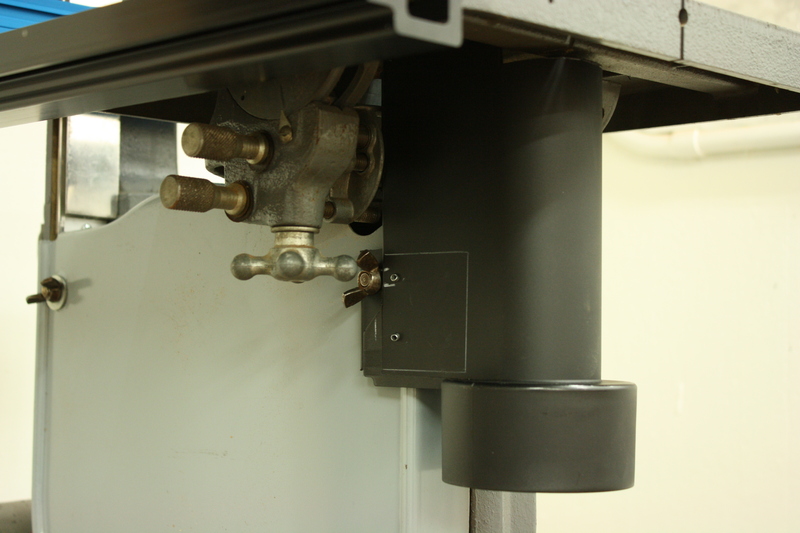 Inside was just the dust collector hood, a cap for the large opening, and a threaded connector. 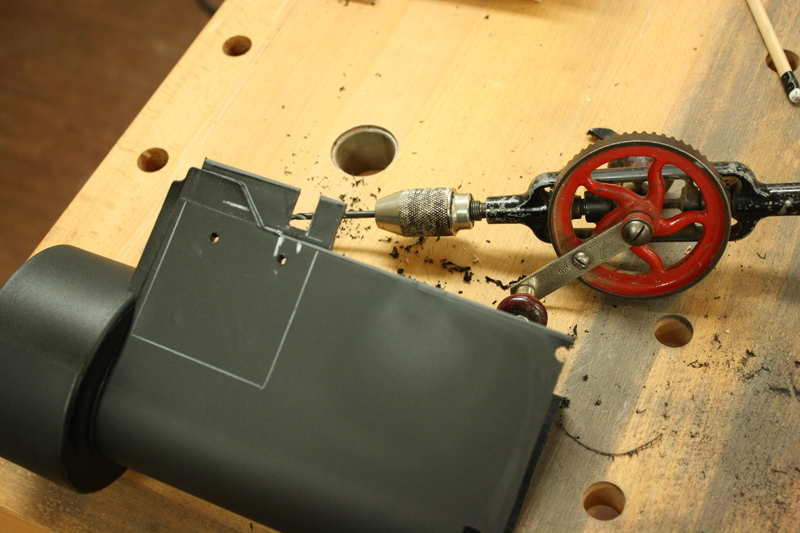 I tossed the connector and cut the hood in half on the bandsaw. 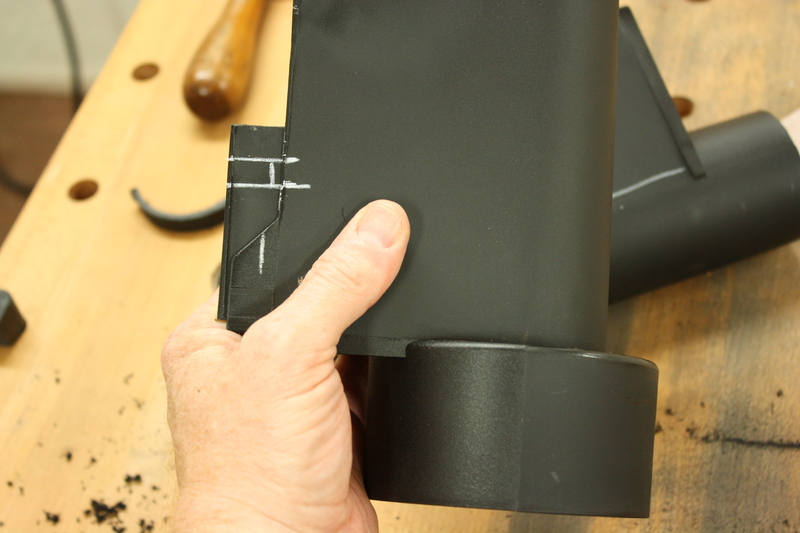 The half with the big opening is what I was going to use for the dust collection. I had to mark and remove some material to get a tighter fit. I decided to use a coping saw for this, rather than fuss with cutting oddly shaped pieces of plastic that I couldn’t get to lay flat on the bandsaw. 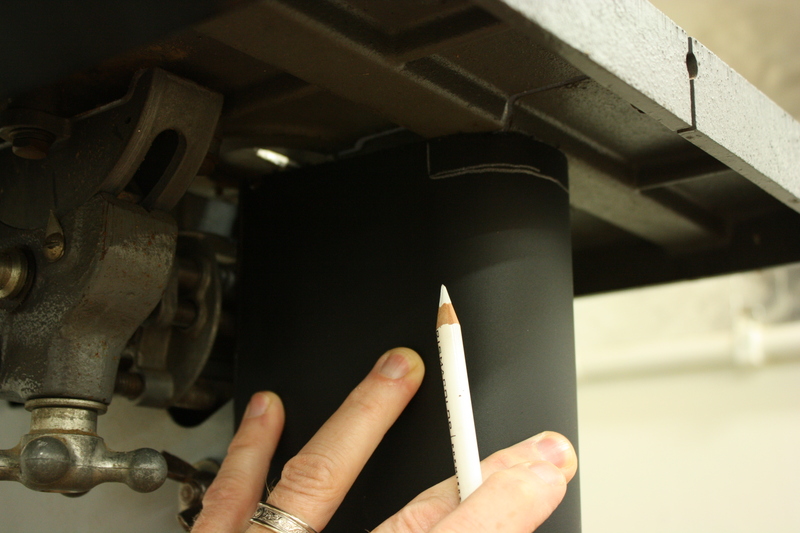 Then I needed to add an extension tab to the dust hood so I could piggyback it onto the threaded post that secures the bottom wheel cover. 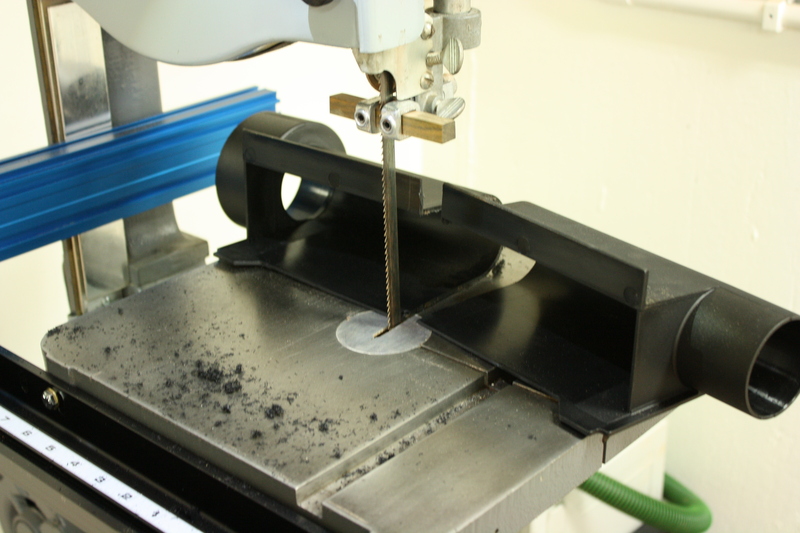 This was the easiest way of attaching the dust hood to the bandsaw without drilling more holes than necessary. 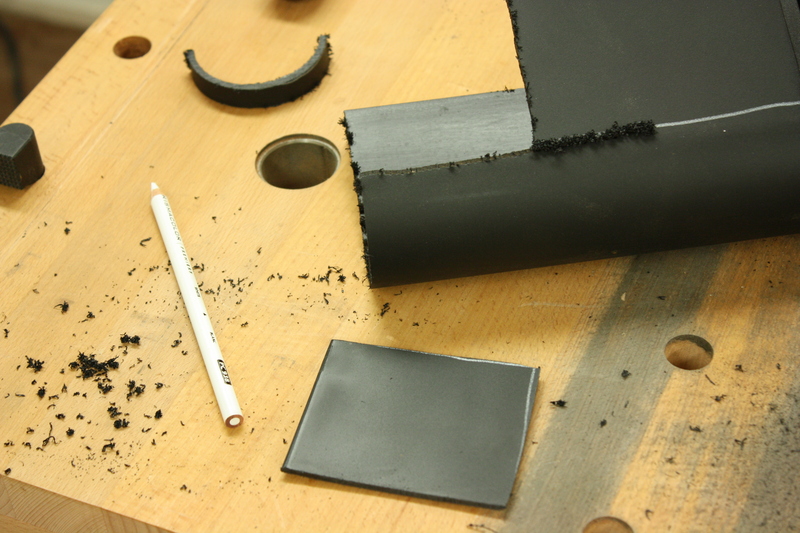 To get the needed material, I cut out a square of plastic from the flat section of the cut-off piece. I held the pieces about where they should be, in relation to the threaded post, and marked my cut lines. 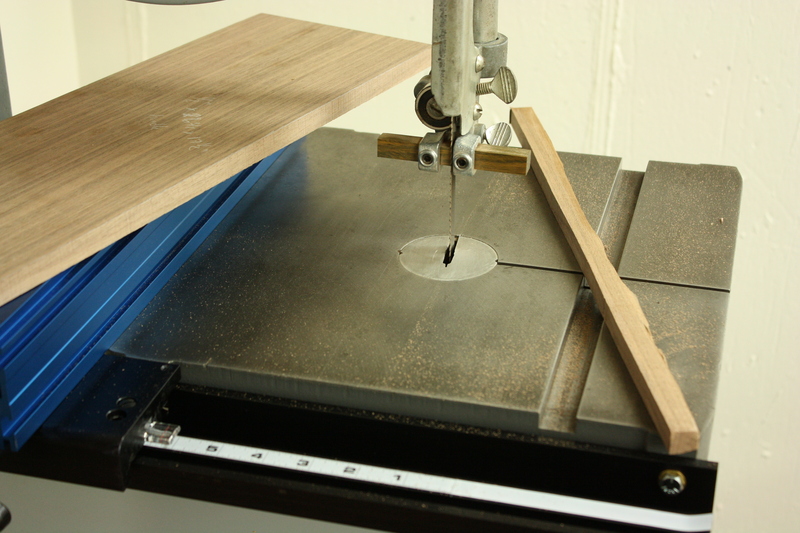 Then I made the cuts with the coping saw. 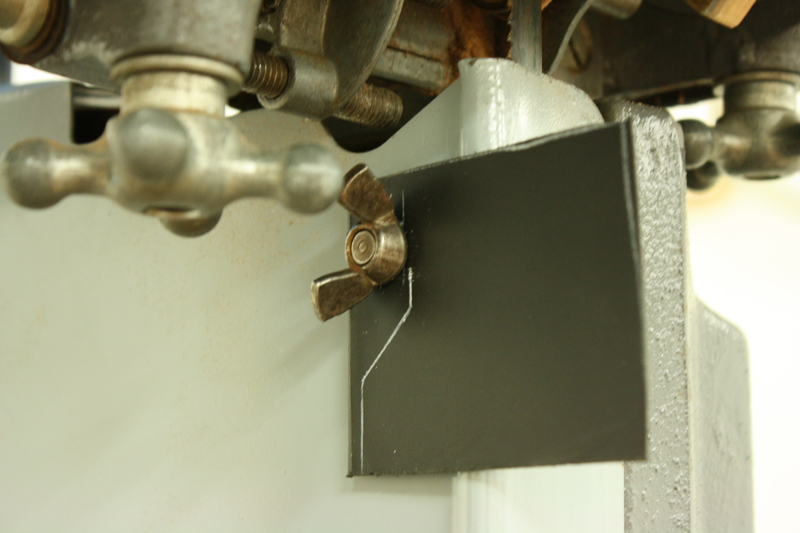 After clamping the square extension in place, I lined up the dust hood and marked where they met up. Holding the extension in place with double-stick tape, I marked locations for rivet holes and drilled them out with a hand drill. Starting the rivets from the inside of the dust hood, I snapped two into place and attached it to the bandsaw to see how I did. The fit was good, but the rivets were not mushrooming enough, probably because of the material. So I picked up some 1/8” rivet washers, tapped out the rivets with a nail punch, and tried again. After a little negotiation with a hammer, I was much happier with the result. In order to use the 2” reducer necessary to hook up my Festool Dust Extractor hose, I needed to cut a hole in the included cap. I chucked a 2” Forstner bit into the drill press and it came out cleanly. At that point, I was able to connect everything the way it needed to be. I did use a bit of foam weatherseal tape to eliminate some of the gaps between the back side of the hood and the cast iron frame. Obviously I was not able to seal up all of the gaps, but I did what I could. Then I set it in place and tightened down the wingnut for the wheel cover. For a test run, I grabbed a piece of walnut I’d already marked for waste removal, turned on the dust extractor, and made a cut. 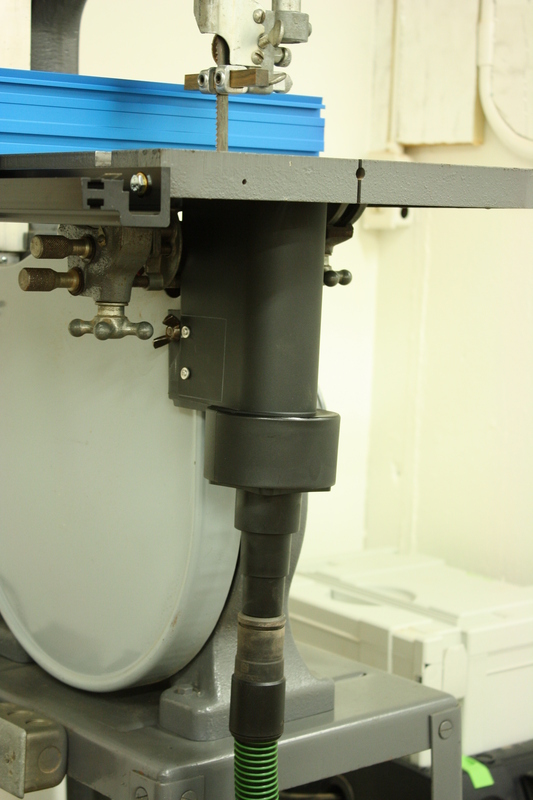 The dust you see on the bandsaw base is coming from the fairly large gap (1/16”) left by the lower wheel cover when it is attached. 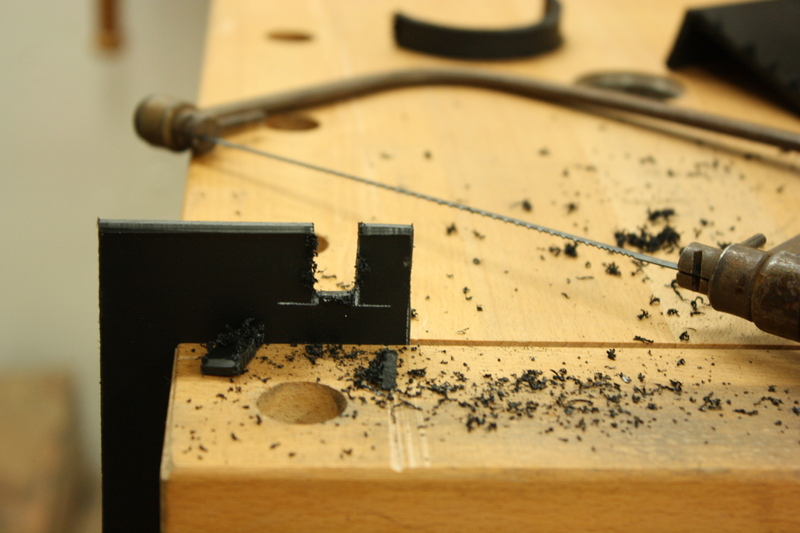 I suppose I could drill a hole in the lower cover and attach a second hose to the bandsaw for better dust collection, but… I’m not so sure I’m ready to permanently modify my bandsaw like that just yet. Maybe I will consider that in the future, though. Compared to what it was like before (lots of dust on the table, base, lower shelf, and floor, as well as a notable amount of dust in the air), this is a huge improvement. There is minimal dust on the table and just a bit of dust on the base. There was no sawdust on the bottom shelf or the floor and the amount of dust floating in the air was significantly reduced, as well. The total cost for this fix was maybe $10 total for the 2” reducer and the rivet washers. I guess you could add another $1 for the cost of the planer hood. Not a bad investment for a healthier shop environment. Looks good. I will have to keep that in mind for when I fix up my old Delta 14″. Thanks, Bill! I’m generally not one for tinkering around with things like this. I’d just as soon buy the appropriate item I need and be done with it. But for the price, I had to give it a try. I was fairly gobsmacked when it worked. Ever give any thought to writing up my invented knitting patterns? Er… thanks for the offer, mum. Sounds tempting, to be sure! I’ll, umm… I’ll have to think about that. In case anyone was wondering, the reason I used rivets to attach the extension to the hood is because glue won’t work. I don’t know what kind of plastic it is, but CA glue does not stick to it very well. So I decided to go with a mechanical fastener. I wanted to get four rivets in, but you have to rivet from the inside out and it was really tight quarters inside the dust hood. 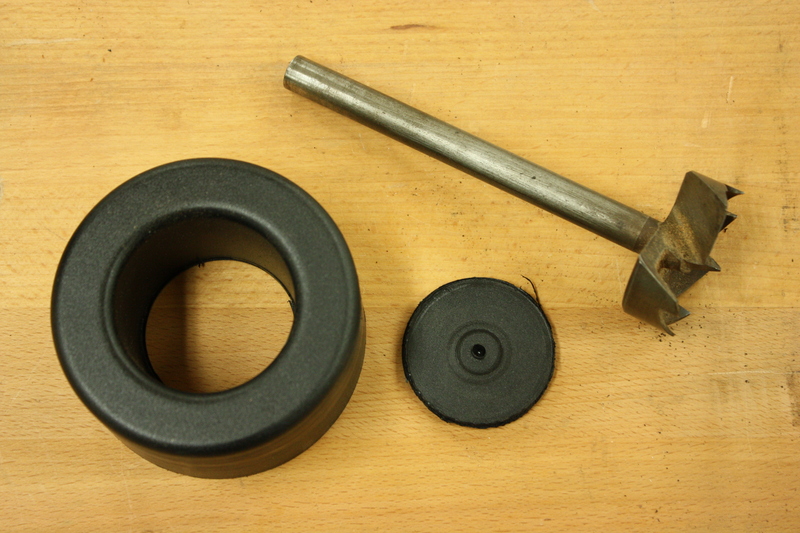 I suppose if I come across some kind of a low-profile rivet gun I can use that to pop two more into it, but it seems to be holding fine right now with the two rivets and the turner’s double-stick tape. Very nice. It looks like a smart and effective solution! I think you were right to use rivets. 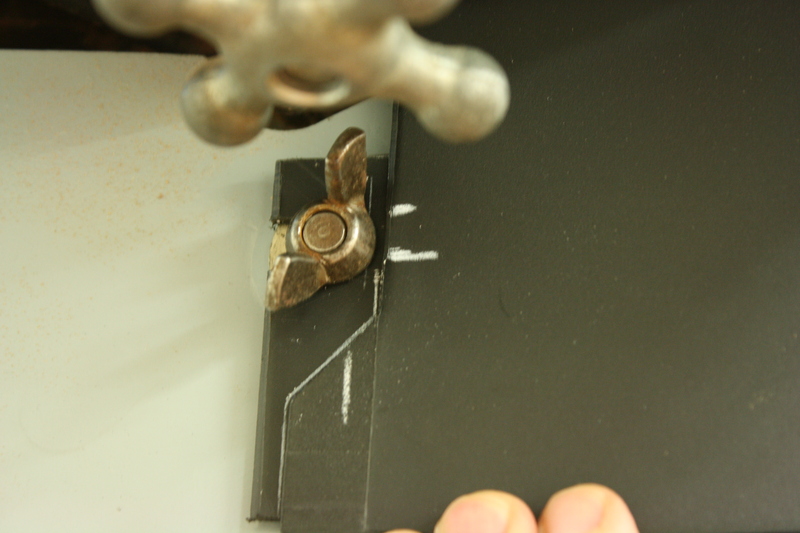 Even with something like contact adhesive, you’d probably have to ‘key’ the surfaces first but I’ve still never personally had much success gluing plastic. Thanks, Olly! Yeah, the guy who showed me how he’d set it up didn’t have rivets in the pictures he took, but he said the hardest part would be attaching the extension because of the challenges of gluing the plastic. It isn’t plastic like a kid’s toy is made of; it feels more like the bumper of a car or some such thing. 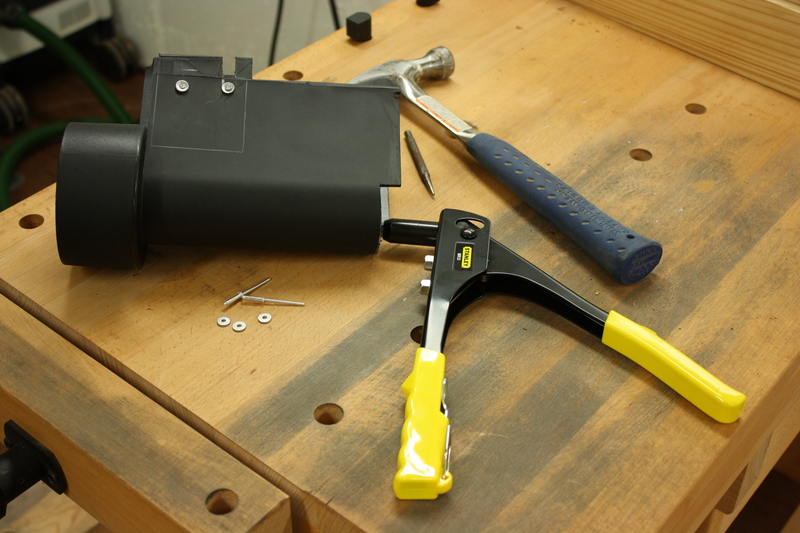 I don’t know how long it would last on its own, but the double-stick tape worked very well for holding it all together while I drilled the rivet holes.